Christine Borland was awarded the honorary degree of Doctor of Letters (DLitt) from the University of Glasgow on 22nd June 2016. Christine Borland was born in 1965 in Darvel, Ayrshire and studied at the Glasgow School of Art (BA Hons Fine Art) and the University of Ulster (MFA). Her work has been exhibited at the Venice Biennale and she was shortlisted for the Turner Prize in 1997. 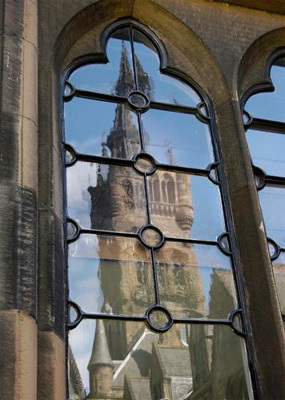 The University of Glasgow commissioned a permanent exhibition in the grounds of the Reading Room in 2001. She is BALTIC Professor of Fine Art, a position held between the BALTIC Centre for Contemporary Art and Northumbria University. Her work has involved collaboration with medical schools and has a particular interest in ‘simulated patients’.